"Country" has changed. And that's what this book is about. For country music in the last forty years has reflected the changing face of America. The music's metamorphosis parallels the transition of a generation that made the switch from rural to urban, from poor to affluent. In these photographs by Raeanne Rubenstein are all the elements of that peculiar mix that is country music today—the legacies from the past, the Kings and Queens of country, the New Wave, the outlaws, the Opry faithful. Country music might have tried to reain some of its back-porch simplicity, but the times have changed and "country" has changed with them. 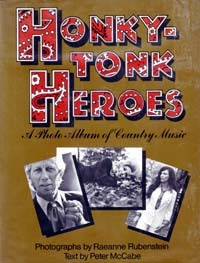 The entertainers featured in this book account for the vast bulk of the country music now being heard on the airwaves of this continent. Today country music is everywhere, and it has incorporated styles of music from everywhere; from black slaves, from Cajuns, from Mexicans and Hawaiians. And in the last ten years, many early rock singers have returned to their country music origins. Country music is the music of America. The Authors: Raeanne Rubenstein's photographs have appeared on the covers of major magazines and countless record albums. She took the photographs for the book Mugshots: Who's Who in the New Earth. Peter McCabe has been an editor at Rolling Stone and Oui magazine, and is former editor-in-chief of Country Music magazine and a nationally syndicated country music columnist. His first work was Apple to the Core, a book about the Beatles' breakup.